Reminiscing that at then LK Advani, one of the founders of the Bharatiya Janata Party, who was jailed during the Emergency, was commented on the way the media behaved -- “you were merely asked to bend, but you chose to crawl”, the New York Times suggests the same party is seeking to resort to almost similar ways now, though the means are different. The saga has continued, it comments: “The newspaper Daily News and Analysis (DNA) pulled an article off its website this month by Rana Ayyub that was critical of Prime Minister Narendra Modi’s appointment of Amit Shah to head the Bharatiya Janata Party, citing the charges of murder, among other crimes, for which Shah is still technically on trial”. 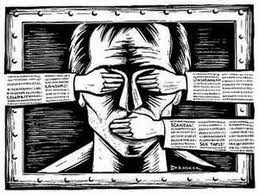 Press censorship, in the newspaper’s view, is not new and has continued in some form in the recent years too. “First, there were the phone calls recorded by tax investigators in 2009 between Niira Radia, a lobbyist for some of India’s most powerful corporations, and members of the media elite that revealed a dismayingly cozy relationship between the two. Last year, the Parliament’s Standing Committee on Information Technology issued its report on the scandal of paid news, in which political parties buy coverage”, it says. Are these morons in NYTimes have some sort of mental disease? What kind of nonsense these dumb and utterly stupid old racists morons come up with? Do they have even mental stability to put even one fact in context? 1. Comparing Emergency to current state - Mentally ill, racist morons! Do you how emergency was? The editors/journalists were arrested, beaten and banned. Half the newspaper used to blackened. How Can these dumb idiots even compare 2014 and 1975? Are you that low IQ? 2. The joke of spewing venom on Modi by racist, christian mentally ill losers is their venom has no bearing on truth whatsoever. Cite some random events with no evidence or events that happened 5 years back or 3 years back and blaming Modi for that? Does these white racist supremacists now hplay the judge,jury and executioners?